It’s been over 3 months since my last post and I have missed spark! and my readers so much. My absence is due to a number of factors, including work and travel, but mostly because I am 15 weeks pregnant! I have just recently emerged from the fog of fatigue and exhaustion that accompanies the first trimester. We are thrilled, grateful and enjoying the journey. I promise that this will not become a baby bump watch or nursery blog over the next five months, but I will share some of my thoughts and ideas on our house shuffle as we prepare to welcome the baby. This week, I plan on sharing some of the updates that have happened around the house in the last 3 months. 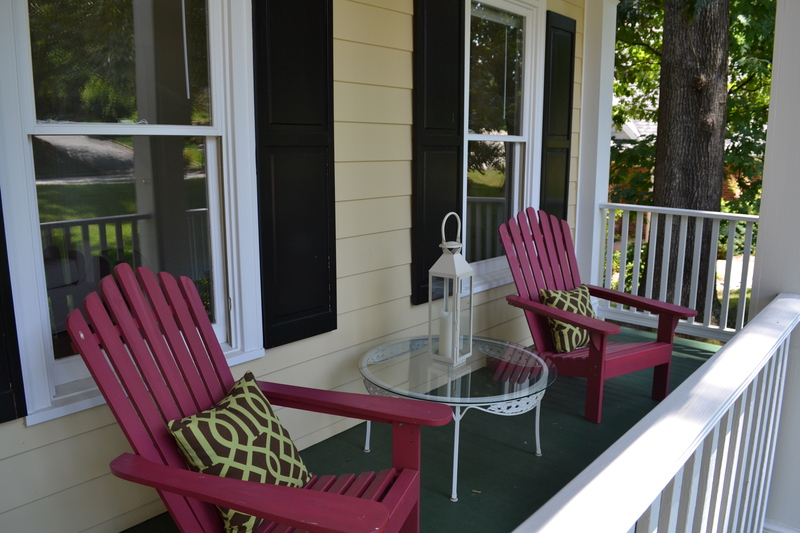 First up, a quick refresh for the front porch. I don’t think I have posted on the front porch since the front door was repainted. I added Target outdoor pillows (in a great Imperial Trellis knock-off fabric) and inexpensive lanterns from HomeGoods ($12 each). 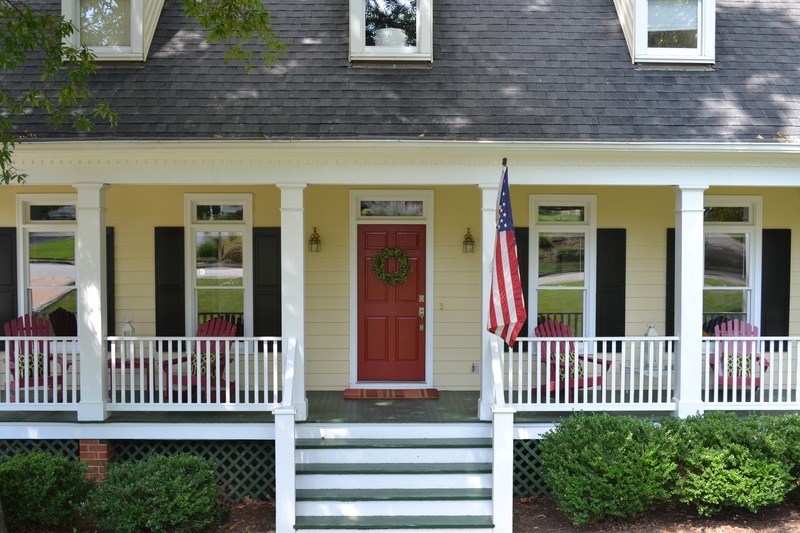 We use the front porch a lot in the summertime, so we have been enjoying its refreshed look. It feels really great to “be back” and my new mantra (after reading Good Enough is the New Perfect) is GOOD ENOUGH. I am going to post as much as my time and priorities will allow! Next up will be a post on the status of my living room update. It’s definitely in-progress. I am not sure that I have ever posted on my living room, so stay tuned, peeps! This entry was posted in Accessories, Bargains, Lighting, Outdoor and tagged Front Porch, Garnet Hill, HomeGoods, Lanterns, Outdoor Pillows, Outdoor Room, Shades of Light, Target. Bookmark the permalink. Congratulations!! I was wondering what happened! That is great news and I know all too well about how taxing the first trimester can be. I’m due in 8 weeks and my first trimester was killer!! Glad you’re back! BTW, your porch looks beautiful and so do you!! Oh my gosh, it looks FANTASTIC! I really need to get over to RVA and visit the HomeGoods again. I haven’t been in months. BTW, if this becomes a baby blog for a little while, so be it! I can’t wait to see the nursery. Did you see that Freckles Chick is expecting, too? 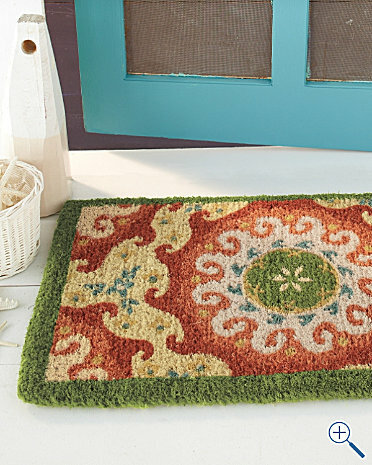 And your porch looks fabulous! Kudos. I am so happy for you! I look forward to updates on your house AND your pregnancy. Woohoo! Glad you are back! You look fantastic! Lots of exclamation marks, but I am really happy for you!!! Congrats! Woohoo! When you said 3 month break in your e-mail yesterday, it made me wonder. I hope you are feeling well! I support your new mantra! And I am jealous of your porch:) Thanks for mentioning Good Enough Is the New Perfect! Congrats!! You look fantastic! I’m 13 weeks pregnant, so I completely understand about the first trimester exhaustion….I took a break from my blog for a while there too! So happy for you, and your porch looks great! Welcome back, Ms. Spark! It’s been too long! You do, of course, look fabulous – glad you’re feeling good too. 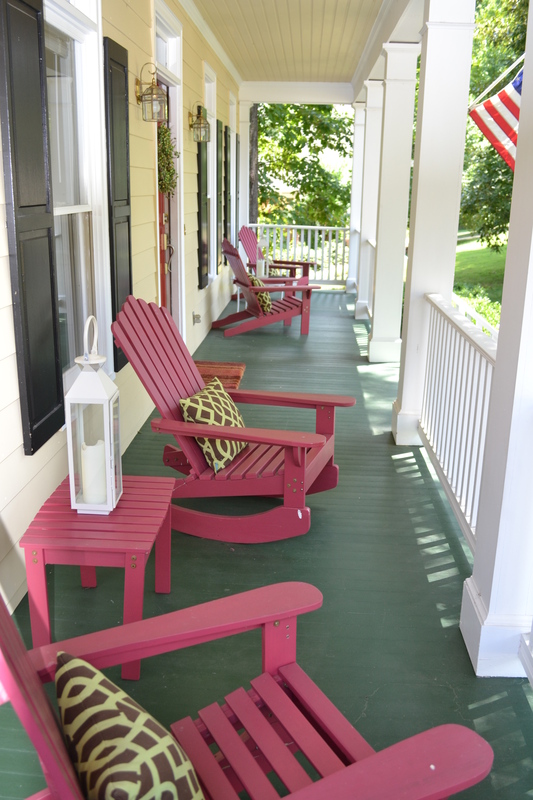 The porch looks mighty nice – makes me want a mint julep.